Maud Palmer Hart, daughter of Thomas and Stella Hart, was born on April 25, 1892, in Mankato, Minnesota. 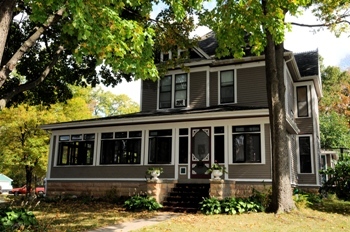 The Hart family lived in this house at 333 Center Street in Mankato, MN from 1892 to 1906. It was here that Maud met her best friend, Frances “Bick” Kenney, who moved into the house across the street in 1898. Maud and Bick were lifelong friends. The tales of their childhood in Mankato (Deep Valley) later became the Betsy-Tacy book series. The childhood homes of Maud Hart Lovelace (Betsy) and her best friend Frances ‘Bick’ Kenney (Tacy) are owned by the Betsy-Tacy Society. Over the past several years these houses have gone through major restoration with the help of the PBS home improvement show, Hometime, many volunteers and sponsors, and hundreds of hours of labor. Betsy’s house is furnished as a museum to look just as it did when the Hart family lived here from 1892-1906. Visitors entering this house will feel as if they’ve gone back in time and stepped into the pages of the Betsy-Tacy books. See the kitchen where Betsy, Tacy and Tib made “everything pudding” and look out the window where Betsy watched the Kelly family move in across the street. 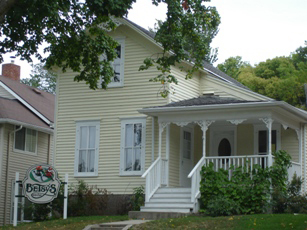 Betsy’s House is restored as a museum, to look just as it did when Maud (Betsy) lived there from 1892-1906. Some of the Lovelace artifacts on display are Thomas Hart’s rocking chair and footstool, a corner cupboard and drop leaf table. 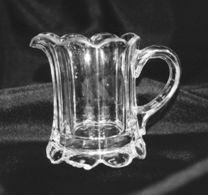 In 2010, the childhood homes of Maud Hart Lovelace and Frances “Bick” Kenney were designated National Literary Landmarks by the Association of Library Trustees, Advocates, Friends and Foundations (ALTAFF), a division of the American Library Association. Frances “Bick” Kenney, daughter of Patrick and Rose Kenney, was born on July 13, 1891, in Minneapolis, Minnesota. The Kenney family lived in this house from 1898 to 1911. 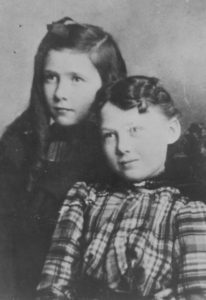 Frances Kenney Kirch and Maud Hart Lovelace were lifelong friends. Maud immortalized the tales of their childhood in Mankato (Deep Valley) when she wrote the Betsy-Tacy series. 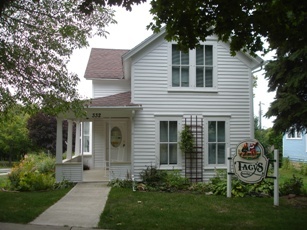 Tacy’s House is an interpretive center and gift shop. 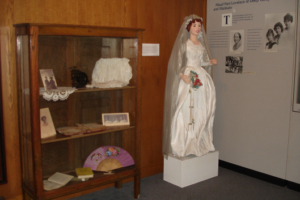 On display are many Lovelace artifacts including books, scrapbooks, photographs, manuscripts, Mrs. Hart’s (Mrs. Ray’s) original brass bowl, and much more. No admission for Gift Shop only. BTS members who show a current membership card are admitted free during regular open hours. Admissions taken at Tacy’s House/Gift Shop. Closed on Sundays, major holidays or for inclement weather. Advance reservations are requested 2 weeks in advance. More than 5 people, additional $5 Adults and $2 Youth 6-16. Private Tour admissions also apply to BTS Members. It is requested there be 1 chaperone for every 6 children. Large groups must be divided into smaller groups for touring the houses. We try to accommodate all requests for special appointments however we cannot guarantee an appointment for requests made for dates less than 2 weeks in advance. When visiting Mankato, you will find that many traces of “Deep Valley” still exist. The Betsy-Tacy Society has maps available for self-guided tours of the Betsy-Tacy sites. Two valuable resources to have when visiting are Maud Hart Lovelace’s Deep Valley and Discover Deep Valley, both books written by Julie A. Schrader. These books and many other resources can be purchased from our online gift shop or at Tacy’s House. Center Street Bench – at the south end of Center Street. 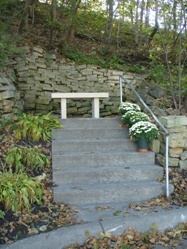 The bench is one of the most remembered settings in the Betsy-Tacy series. The childhood home of Marjorie Gerlach (1892-1964) who was the real-life character of Tib Mueller in the Betsy-Tacy books. Henry and Minnie Gerlach raised a family of four children in this house. Henry was an architect who designed and built this house and many other Mankato area buildings and homes, some of which are listed on the National Register of Historic Places. This little historic park was an important landmark in the Betsy-Tacy books. 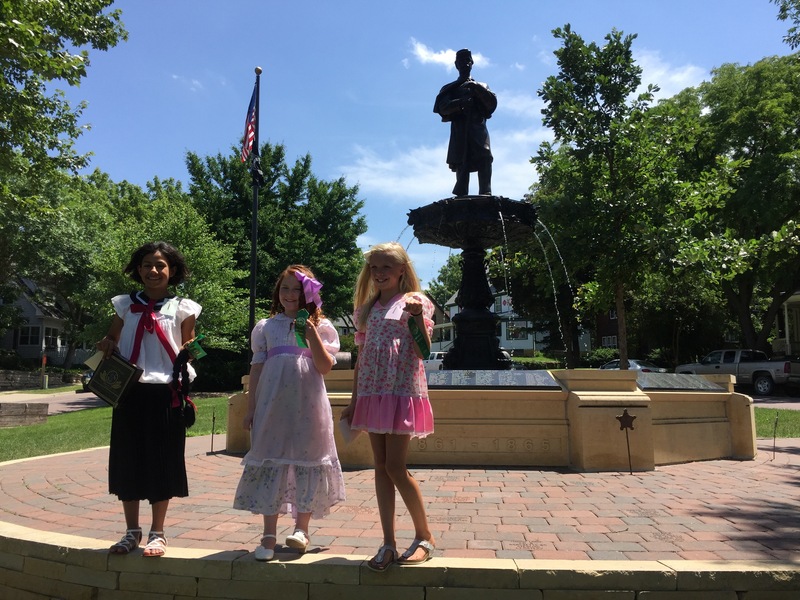 The park marked the edge of the neighborhood and as the girls grew older, they were allowed to venture downtown past Lincoln Park. The Civil War Memorial Fountain was rebuilt in the park and dedicated in 2015. Read more about it here. The Carnegie Library opened its doors in 1904. “It was on a snowy day that I made the acquaintance of the Mankato Public Library with its children’s room and the (for me) prophetic painting of Delos above the mantelpiece.” MHL, 1960. 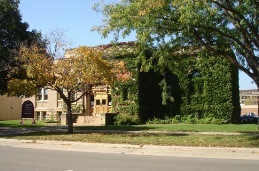 Today the building is the Carnegie Art Center. For hours call 507-625-2730. Deep Valley mural, original Lenski illustrations, the original “glass pitcher,” and autographed collection of Lovelace books. 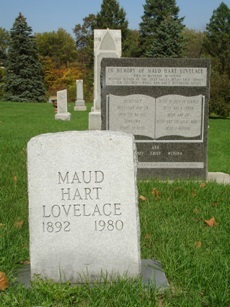 The final resting place of author, Maud Hart Lovelace. Many other characters from the Betsy-Tacy books are buried in Glenwood. 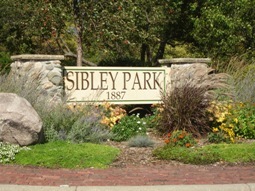 Sibley Park is Mankato’s oldest and largest park. The Hart family liked to picnic at the park and it was a popular location for fun and picnics when Betsy, Tacy and Tib were in high school. From atop the hill behind Maud’s home on Center Street, she could look down on the whole town and see Front Street and Sibley Park.